Update at March 7, 2014: ICD-11 has been postponed by two years. It is now scheduled for presentation for World Health Assembly approval in 2017. Update at August 15, 2012: On Page 3, I stated that Steven Hyman, MD, is a DSM-5 Task Force Member and that Dr Hyman chairs the meetings of the International Advisory Group for the Revision of ICD-10 Mental and Behavioural Disorders. According to the DSM-5 Development site, Dr Hyman is no longer a member of the DSM-5 Task Force, having served from 2007-2012. I cannot confirm whether Dr Hyman continues involvement with the International Advisory Group for the Revision of ICD-10 Mental and Behavioural Disorders though his name remains listed on the WHO site page, or on what date or for what reason Dr Hyman stood down from the DSM-5 Task Force. 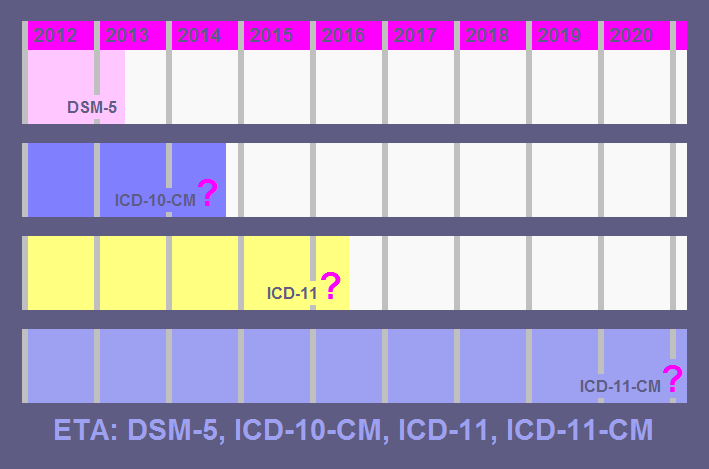 While the US health care industry, professional bodies and clinical practices sweat on the announcement of a final rule for ICD-10-CM compliance and speculation continues over the feasibility of leapfrogging from ICD-9-CM to ICD-11, I thought I’d run through the timelines. Originally slated for publication in May 2012. In December 2009, the American Psychiatric Association shifted release of DSM-5 to May 2013, in response to slipping targets. With no changes to the published Timeline and no intimation of further delays, I’m assuming DSM-5 remains on target. The final manual is scheduled for submission to American Psychiatric Publishing by December 31, 2012, for official release, next May, during APA’s 2013 Annual Meeting in San Francisco. Following closure of the third and final public review on June 15, 2012, draft proposals for disorder descriptions and criteria sets as published on the DSM-5 Development website were frozen. The DSM-5 website will not be updated with any further revisions made by the work groups between June 15 and going to print. Final criteria sets and manual content are under strict embargo until publication . The development process for ICD-10-CM is as old as God’s dog. WHO published ICD-10 in 1992. Twenty years on, while the rest of the world has long since migrated to ICD-10, the US is still waiting to transition from ICD-9-CM to a US specific clinical modification of ICD-10. The US is still using a modification based on WHO’s long since retired, ICD-9, and a code set that is now over 35 years old. The Tabular List and preliminary crosswalk between ICD-9-CM and ICD-10-CM were posted on the NCHS website for public comment in December 1997. Field testing took place nearly ten years ago, in the summer of 2003. The proposed rule for the adoption of ICD-10-CM/PCS was published in August 2008 with a proposed compliance date of October 1, 2011. In January 2009, the Department of Health and Human Services (HHS) published a final rule adopting ICD-10-CM/PCS to replace ICD-9-CM in HIPAA transactions, with an effective compliance date of October 1, 2013. On February 16, 2012, HHS Secretary Kathleen Sibelius announced intent to postpone the compliance date for adoption of ICD-10-CM/PCS codes sets for a further year, to October 1, 2014 to allow more time for providers, payers and vendors to prepare for transition. Public comment on the proposed rule closed in June. An imminent decision on a final compliance rule is anticipated but no date by which a decision would be announced has been issued. Annual updated releases of ICD-10-CM and associated documentation have been posted on the CDC website for public viewing since January 2009. CMS has issued the 2013 release of ICD-10-CM and General Equivalence Mappings (GEMs) which replace the December 2011 release. Until an implementation date is reached, codes in the 2013 release of ICD-10-CM are not currently valid for any purpose or use but are available for public viewing on the CDC website. October 1, 2011 was the last major update of ICD-10-CM/PCS until October 1, 2014. Between October 1, 2011 and October 1, 2014 proposals for revisions to ICD-10-CM/PCS will be considered only for new diseases/new technology procedures and minor revisions to correct reported errors. Regular (at least annual) updates to ICD-10-CM/PCS will resume on October 1, 2014. These Partial Code Freeze dates are based on the original compliance date of October 1, 2013. It’s reported that postponement of the requirement for compliance until October 1, 2014 would also push back scheduled ICD-10-CM coding updates. If the proposed compliance date of October 1, 2014 is instituted, adoption of ICD-10-CM would become mandatory around 18 months after publication of DSM-5. The first regular updates to ICD-10-CM would resume one year post compliance date, that is, from October 1, 2015. On April 9, the US Department of Health and Human Services issued a proposed rule calling for a one year delay in the ICD-10-CM/PCS compliance deadline. 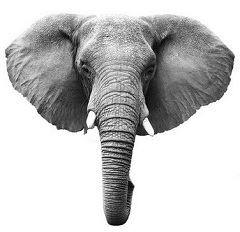 The proposed rule would postpone the compliance date by which providers and industry have to adopt ICD-10-CM by one year, from October 1, 2013 to October 1, 2014. The proposed rule was published in the Federal Register on April 17, followed by a 30 day period during which CMS will take comments. Comments should be submitted to HHS no later than 5:00 pm ET on May 17, 2012. For delivery by hand see the Alternate Ways to Comment pop up, top right of Submit a Comment page. This proposed rule would implement section 1104 of the Patient Protection and Affordable Care Act (hereinafter referred to as the Affordable Care Act) by establishing new requirements for administrative transactions that would improve the utility of the existing Health Insurance Portability and Accountability Act of 1996 (HIPAA) transactions and reduce administrative burden and costs. It proposes the adoption of the standard for a national unique health plan identifier (HPID) and requirements or provisions for the implementation of the HPID. This rule also proposes the adoption of a data element that will serve as an other entity identifier (OEID), an identifier for entities that are not health plans, health care providers, or “individuals,” that need to be identified in standard transactions. This proposed rule would also specify the circumstances under which an organization covered health care provider must require certain noncovered individual health care providers who are prescribers to obtain and disclose an NPI. Finally, this rule proposes to change the compliance date for the International Classification of Diseases, 10th Revision, Clinical Modification (ICD-10-CM) for diagnosis coding, including the Official ICD-10-CM Guidelines for Coding and Reporting, and the International Classification of Diseases, 10th Revision, Procedure Coding System (ICD-10-PCS) for inpatient hospital procedure coding, including the Official ICD-10-PCS Guidelines for Coding and Reporting, from October 1, 2013 to October 1, 2014. The timeline on the DSM-5 Development site was updated to reflect a “Spring” posting of draft diagnostic criteria but thus far, APA has released no firm date for a final public review and feedback exercise in May. The second release of draft proposals was posted on May 4, last year, with no prior announcement or news release by APA and caught professional bodies, patient organizations and advocates unprepared. It is hoped that APA will give reasonable notice before releasing their third and final draft – though how much influence professional and public feedback might have at this late stage in the DSM-5 development process is moot. DSM-5 is slated for publication in May 2013. Spring 2012: Revised draft diagnostic criteria will be posted on http://www.dsm5.org and open to a third public feedback period for 2 months. Feedback will be shared directly with work group members, and further edits to proposals will be made as needed. The full DSM-5 Timeline (as it stands at April 8, 2012) can be found here. The current timeline schedules presentation of the ICD-11 to the World Health Assembly in May 2015 – a year later than the 2009 timeline. The ICD-11 Beta drafting platform is scheduled to be launched and open to the public this May for comment and interaction. It will be a work in progress – not a final Beta draft. The final Beta draft isn’t scheduled until 2014. No announcement that the Beta platform remains on target for a May release has been issued by WHO or ICD-11 Revision Steering Group and no date is given on the ICD Revision website for the launch. The publicly viewable version of the Alpha drafting platform (the ICD-11 Alpha Browser) can be accessed here. The various ICD-11 Revision Topic Advisory Groups work on a separate, more layered multi-author drafting platform. NB: The Alpha drafting platform is a work in progress. It is incomplete, in a state of flux, updated daily and subject to WHO Caveats. ICD-11 Alpha Browser User Guide here. PDFs of Draft Print versions of the Linearization are available from the Linearization tab to logged in users. The ICD-11 timeline (as it stands at April 8, 2012) can be found on the WHO website here. Note: ICD-10-CM is the forthcoming US specific “Clinical Modification” of the WHO’s ICD-10. Following implementation of ICD-10-CM, the US is not anticipated to move on to ICD-11, or a Clinical Modification of ICD-11, for a number of years after global transition to ICD-11. It is anticipated that CMS will make an announcement in the Federal Register, take public comment for 60 days, consider feedback on its proposed ruling, then issue a final rule.